Thank you for offering to be a Group Contact and help to form a new interest group for the Edenbridge U3A. It may seem a little daunting to be taking on this role at first but your support is very important in helping to start our local U3A. This information is intended as a guide to get you started and to answer some of the questions that you might have as we get ready to launch the Edenbridge U3A. What does running an interest group involve? 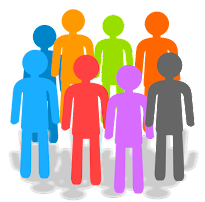 Edenbridge U3A has settled on the name Group Contact for the person who pulls the group together. There are often two roles within an Interest Group. First of all, There is an administrator or secretary to maintain the list of members' details and circulate it. That person will have responsibility for initially recruiting at The Edenbridge U3A Launch and afterwards at monthly meetings. That is what we mean by Group Contact. Then there is another aspect that involves supervising the programme and support material, of handouts, photocopied articles, an agreed reading list or the learning content of the topic. That is more of a Group Leader role. The two roles can be carried out by one person, but there are still two clear sides to the work of organising a group. Some groups, especially languages, work well with an expert, native speaker plus a Contact. Being a Group Contact always involves a certain, usually modest, amount of organisational and administrative work, but also quite a lot of satisfaction and enjoyment. Always remember that sharing learning means that, as a U3A Group contact, you are not alone. There are many sources of support available to you including the members of the committee, members of your group; other Group Contacts (including those in other local U3A's) and the extensive services of the national U3A. If you want to talk to someone about aspects of your group, you can approach another Group Contact in one of the local (or national) U3A, who runs the same sort of subject. Other Contacts are keen to help a new group start. This section provides some information for getting started in preparation for the Edenbridge U3A Launch and for your first group meeting. At this stage, you have an idea for an interest group that you would like to start. You may already have a nucleus of interested people and ideas on the aims and scope of your group. However, it is more likely that you wish to test the water for an idea which, as yet, has an unknown level of interest. The first step is to consider what the focus of your group will be. A social or activity group with no defined educational aim. Choose a short, simple name that expresses exactly what it will cover. Music Appreciation is better than Getting more out of Music. It needs to be self-explanatory. Put the key word first. Of course, some subjects are more suitable than others. Many U3A groups are a discussion group and so a slant that emphasises personal involvement will make the best use of the members' experience. Resources and facilities and accommodation are all limited, so a Chemistry group may not take off because there is no lab, but a Science Discussion group will. Because it is flexible, and deals with small numbers, the U3A can easily include visits as part of a study programme. If this is so, name the group accordingly as London Visits, for example, and everyone will know you are regularly going to see sites in London. Consider the Time and Place for the Group. As Group Contact, it will be helpful to have some ideas about when and where the group will meet. You will need to set a date and venue for the first meeting of the group. Usually in members' homes but, if this is going to be a large group, such as Painting and Drawing, and needs more space than the average house affords, then the group should hire a hall. This is funded by the members of the group. Charge enough to give a surplus in case there are sessions that are less well attended, or think about charging per term. The committee are currently looking for local venues that will be willing to hire rooms and equipment so if you think your group might need these please talk to the Groups' Coordinator or any member of the committee. One member may offer their home for all the meetings, but remember that moving furniture, finding enough chairs and making tea or coffee every time can become a chore, so you may choose as a group to move around members’ homes. Venues should be accessible, even in bad weather and parking can also be an issue. Those without transport need to be considered too. At a first meeting, the members find a date by consensus. Two hours for each session is normal, so perhaps 10-12 or 2-4, but this varies. A U3A group usually meets on a weekday, in daylight hours. It will start in October as a rule, and have 2 or 3 months off in the summer. But groups like a Garden Group will close down in the winter, or develop an alternative programme. A rest is good for everyone! The majority of groups meet monthly, e.g. on the first Thursday morning (avoid 'fortnightly' in favour of 1st and 3rd Tuesday, and don't go for three-weekly, which is too complex in the diary.) Twice a month is good for languages, or weekly if you can fit it in. Some groups alternate an introductory talk at one session, with a follow-up visit two weeks, or a month later. You will work out together what suits your subject best. Groups will be advertised in newsletters and on the website (once we get started). So, we will be asking you to provide a short description of your group. Here are some examples from other U3As. Our walks of approximately one hour are mainly on level ground, generally using designated pathways. We observe the seasonal variations in both town and countryside, in and around Aylesbury. The Wendover Woods walk is a particular favourite and also the wonderful views from Coombe Hill. It must be mentioned that we drive up to the summit, as this group caters for the less intrepid walker! We often share transport, to facilitate parking and to minimise parking charges. After the walk, those who are free to do so round off the morning with lunch at a nearby restaurant or pub. This is a relaxed and informal group where the aim is to encourage members to talk freely about a wide range of things that interest them. Other activities include watching DVDs, listening to CDs and reading. We also indulge in quizzes, word games, poetry reciting and singing songs. Members are encouraged to do a certain amount of preparation between sessions. 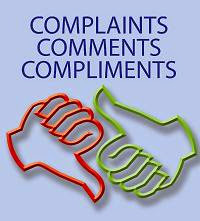 Let the Groups Co-ordinator know all about it and either you or he can speak about it at a monthly meeting. You can also give details for this website and you will be given a dedicated page for the group on the Groups Page. 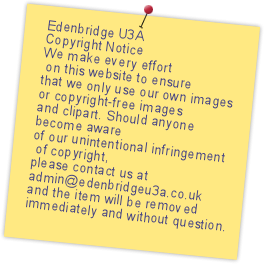 Please contact admin@edenbridgeu3a.co.uk to do this. What is the group to be called? Where and when will it meet, and how often? What resources will it need? What are its aims and how are these best met? How is the work to be shared in a fair way? How long is the group expected to run (or how long will the subject last)? Are there any costs involved and how will these be shared? However, if you don't access the internet, it is probably best to give this job to someone in the group who does. The Group Contact is asked to record the name of everyone attending. This is a requirement of the insurance cover provided by The Third Age Trust. Please send the register to the Group Co-ordinator, when requested, and notify them of any changes to the group. All groups are self-financing. The Contact should keep a simple record of income and expenditure. Any surplus may be spent in any way that benefits the learning of the whole group. for sharing their experience of running groups.